Other people have been helping me relive the transition from Summer to Autumn in the traditional English way. Claire from Things We Make and Gill from My Tiny Plot were harvesting the last things in their gardens, Aran from Canelle et Vanille was gathering hazelnuts (in Florida) and cooking with pears. I can smell the wood smoke, hear the crackling of bonfires and feel the nights drawing in. All have been preparing for the dying down and dormancy of nature. Here in Dubai, this time of year is the reverse for me. The days and nights of stifling humidity are finally giving way to freshness and blue skies. My herb pots that I left in July as I went to the UK for two months are parched and drooping. It’s time to clear them all out and plant new seeds. The woody herbs like oregano and thyme survive the searing temperatures here, after all it does get pretty hot in Provence, but the additional moisture in July, August and September finish them off. Surprisingly some garlic chives which I planted have revived with abundant grassy strands and delicate white flowers. One book I brought back from England that I’ve been cooking my way through is Plenty by Yotam Ottolenghi, but I turned to his first book for inspiration for these little tarts. I replaced the recommended goat’s cheese with feta in an attempt to tempt my vegetarian daughter. I failed but her loss was my gain. Make these when you have plenty of time but you can break the recipe up in to stages (e.g. make the pastry cases and fillings one day and finish off the next). The garlic chives from the garden added a lovely savoury freshness to the autumnal flavours of the pumpkin and spiced carrot. By the way, if you are in Dubai, you can get the small tart tins (non-stick and loose-bottomed) from Lakeland in Mirdif City Centre. Do the changing seasons affect the way you feel (and the flavours you use)? Make the pastry first. Sift the flour into a large bowl and add the salt (you could also add 25g of poppy seeds at this point – I didn’t). Rub the butter into the flour until the mixture resembles fine breadcrumbs (I do this in a food processor or in my KitchenAid with a paddle attachment as Dubai is always too hot for great pastry making). Add the milk and stir until the mixture just starts to form a ball. Shape the dough into a fat disc, wrap in cling film and chill for a few hours. While the squash is cooking, heat the remaining oil in a large saucepan and add the mustard seeds. Cook until they start to pop, then add the grated carrots and cook, stirring frequently, for 10 minutes. Stir in the sugar, white wine vinegar and orange juice, bring to the boil and then simmer on a low heat for 20-25 minutes until almost all the liquid has evaporated. Leave to cool. Brush the inside of 6 tarlet tins (10cm diameter, 2cm deep) with melted butter. On a lightly floured work surface, roll out the pastry to 3-4mm thick. Cut out circles and line the tins evenly, cutting off the excess pastry. Chill the cases for at least 30 minutes before baking blind at 170 C for 20 minutes. Remove the greaseproof paper and baking beans and return to the oven for 5-10 minutes until golden brown. Leave to cool. Raise the oven temperature to 180 C (Gas Mark 4, 356 F). Combine the egg yolk, cream, chives, parmesan, a pinch of salt and a generous grinding of black pepper in a large bowl (I used my KitchenAid). Whisk together until the cream forms soft peaks and then refrigerate for at least 10 minutes. Divide the carrot mixture equally between the pastry cases, spreading it over the bases. Top with butternut squash and crumble the feta over it. Place the tartlets on a baking tray and spoon over the cream mixture. Bake for 8-10 minutes until the filling is golden and set. Remove the tarlets from their tins as soon as they are cool enough to handle. Serve warm (although good cold too). A rocket salad makes a great accompaniment. These would be ideal picnic food. If you make these, let me know if you enjoyed them as much as I did. 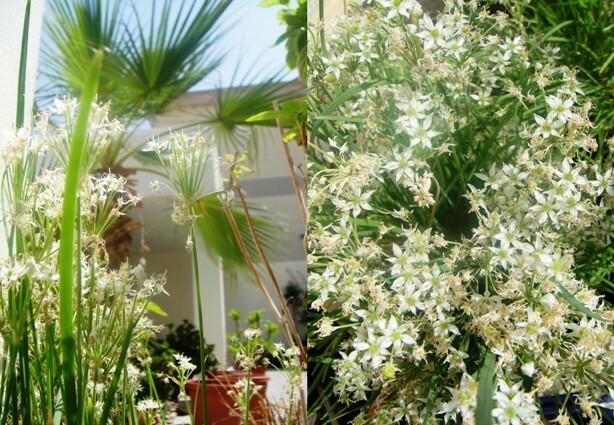 Oh i love winters in Dubai – when the trees are barren everywhere else in europe the are blooming there. these tarts are just up my road sally! love them. I must say it is rather lovely here at the moment. I miss crisp Autumn days sometimes though! Oh delicious. Will make these very soon. Do you think that this will work as one big tart too? I don’t see why not Anja – although doing them as tartlets was easy and gave you a nice amount of pastry. And yes they were delicious! What a lovely lunch idea and I love that they are individual tartlets. These look lovely, Sally. Funny to think of the seasons being opposite to ours. It’s all gale force winds here are the moment. Mmmmmmmmmmmmmmmmmmmmmmmmmmmmmmmmmmmmm. Why can’t I have lunch at your house? Because you’re in Singapore darling! But this has to be rectified! ohhh, your baby tarts are so perfect! I am so envious, need to learn from you! Looks totally delish Sally, what a perfect seasonal recipe! 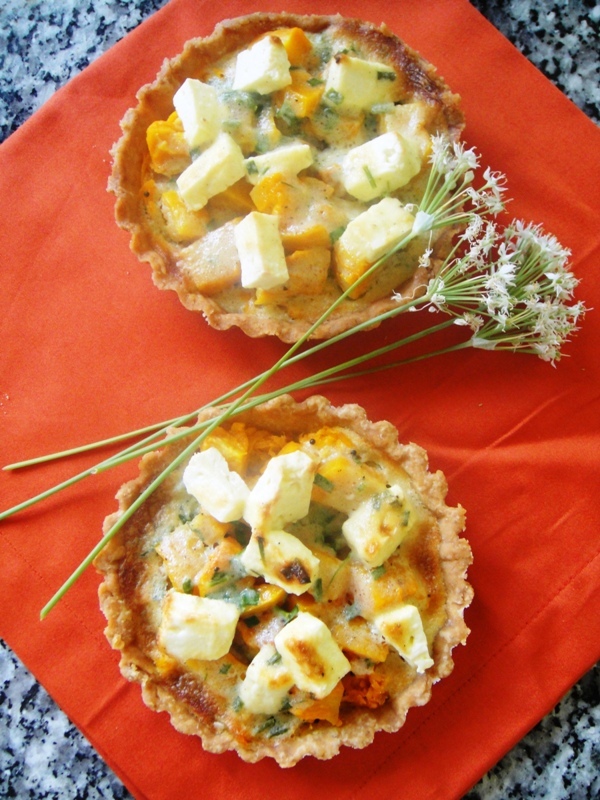 I found doing little tarts much easier than big ones – maybe this is a pastry revelation! Old Sony Cybershot point and click for this one. Love them Sally, as I love everything about Ottolenghi and their food philosophy! YUM!! Oh I agree Deeba…double yum. Thanks Jane – FoodPress is excellent so thrilled to be part of it. Those tarts look amazing. I recently did one with pumpkin, feta and sage. It was a total hit. Thanks for sharing! The addition of sage is a great idea. The changing seasons definitely affect the way I feel about food and the seasonings and ingredients I use; we like to cook and eat seasonally at our house but find that if we stick to that very strictly that we lack a lot of good greens throughout the year. These look super! 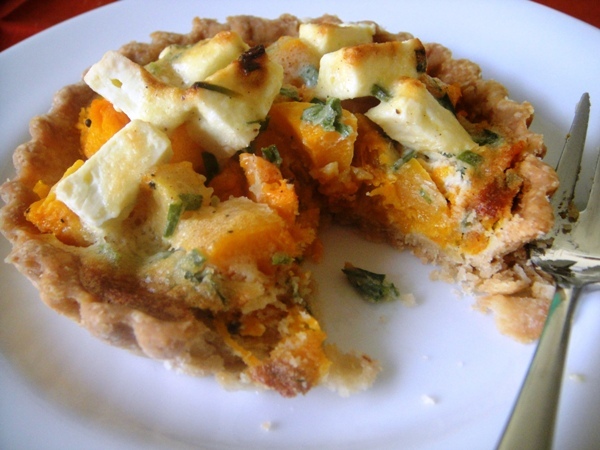 I haven’t made any butternut tarts for ages, I think it’s time to do another! These look so delightful! I love feta cheese. And your photo is beautiful with the garlic chive flowers and red background.